All Aboard! We'll be waiting on the platform at 30th St Station for the train that will take us to the National Bike Summit in Washington DC, which runs from tomorrow until Thursday when we march on Capitol Hill. The National Bike Summit began in 2001 with just 100 participants and this year will boast nearly a thousand. 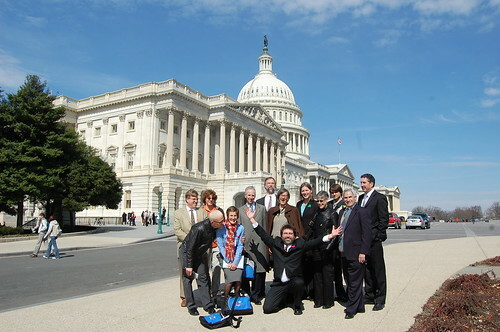 I have been representing the Bicycle Coalition at the Summit since 2002 and this year nearly two dozen of our staff members and volunteers will be calling on our members of Congress. Also this year The New Jersey Bicycle Coalition, Bike Delaware and PA Walks and Bikes will be sending a record number of attendees from all three states, which means that our region will be well represented. Follow the National Bike Summit on Twitter with the hashtag #nbs10. BikePortland.org will also be offering extensive coverage of the event. And even if you don't go you can participate in a virtual lobby day by calling your Congressional reps on Thursday. Stay tuned for details on that.